Each of these are then further complimented with additions should the basic set not be enough. These include leg press attachments, cable columns, aluminum pulley system and mounted accessory rack. This guarantee covers every single part of the machine, from the frame and welds to the cables and upholstery. Few other machines offer such full coverage. Unlike most home gyms that require alterations as different parts of the machines are used, the G6B is fully optimized to require no cable changes at all, saving space and time. The specially designed feature keeps the wires and weights moving frictionless throughout its lifetime. Patented Bi-Angular® converging press station replicates a free weight dumbbell press and produces 25% more muscle interaction. 210 lb. (95kg) selectorized weight stack.selectorized weight stack. Overall, users have found the G6B to be an incredibly well designed full body gym. It is touted as being capable of well over 50 different types of workouts and even comes with written directions and a complimentary DVD. It’s most impressive feature is that it was built with your body's natural mobility in mind. Aside from always keeping the back and the core stable, the rest of the body generally follows a comfortable range of motion during the various presses and curls. Instead of forcing your arms and legs into a static position for this, it allows them to make those minor adjustments they normally do with free weights. This then also increased muscle interaction by 25%. The pads are a high density DuraFirm with included lumbar support for comfort and lower back protection. Its gas-assist adjustable seat is ideal for quick changes as you move from workout to workout. There is even a seated row foot brace plate that acts as a stabilizer during your highest reps. All in all, you get what you pay for. Arguably, every aspect of this machine is of the highest quality and durability. While it does measure in at an impressive 85" x 50" x 83.5" and weighs in at over 200 pounds, it is very much a space saver in that there are no surrounding stations. The seat is fully adjustable so that you can do everything in one area. Know that when you buy this machine, you will need to have a can of silicon spray. While the cords are designed to be frictionless, dirt will nonetheless accumulate, causing a less-than-smooth motion. This can even start up one week after you start using it regularly, so be prepared. Once it is applied, however, the problem is solved. Even though it is small for its caliber, this machine is big. It is not designed to fold up and store nicely in a closet. It comes in six boxes and takes about 8 hours’ worth of work to finally piece together. This is not helped by the fact that the directions have a few errors. When taken in light of its competitors, it is one of the largest and most expensive with only other Body-Solid machines coming near its over $2,500 price tag. Also, even though it claims to be able to perform 50 different exercises, only a few are listed within the included manual and DVD, meaning the rest you have to either discover on your own or ignore. This can be rough for those that tire of repetitiveness quickly but who are thinking about this machine because of its versatility. 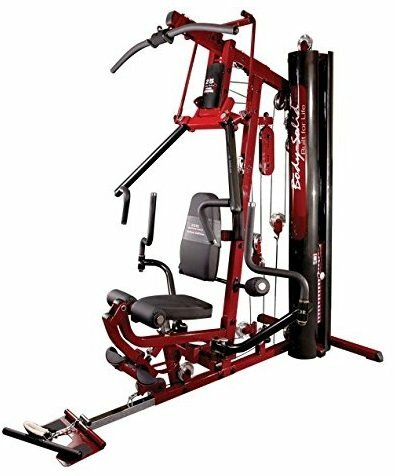 This Body-Solid G6B Home Gym, though expensive, is a high quality piece of machinery that mimics the benefits of free weights without handing you a bar. For those without the money, look more toward something like the Powerline BSG10X or for those with limited space, something like the Bowflex PR1000. However, if neither of those are issues, the G6B stands out among its competitors in terms of space saving if only because most machines at this price also come with numerous seated stations but lack the allowance of full motion ranges. While free weight fans will still scoff at it, those that need a bit more safety and protection when it comes to form will find no equal in terms of quality and longevity than the Body-Solid G6B Home Gym.